“Entertainer of the Year” will be announced live on stage during the two-hour star-studded TV One telecast, February 11. 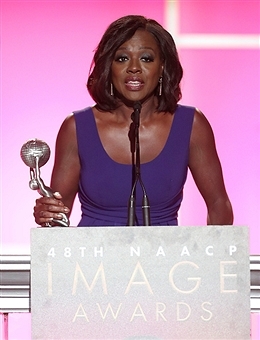 Ali, Davis and DuVernay were winners of the “48th NAACP Image Awards” in the non-televised categories, which were announced during a gala dinner celebration on Friday. Hosted by Erica Ash and Deon Cole and held at the Pasadena Conference Center, Mahershala Ali continued to add to his collection of trophies receiving an Image Award for Outstanding Supporting Actor in a Motion Picture for “Moonlight,” while Viola Davis received the Outstanding Supporting Actress in a Motion Picture for her Denzel Washington directed drama “Fences.” Director Ava DuVernay earned the Outstanding Writing in a Drama Series award for the TV series “Queen Sugar” at the non-televised event which reviled winners in 47 categories. The remaining 9 categories including Entertainer of the Year, will be announced live on stage during the two-hour star-studded TV One telecast, February 11 at 9:00pm, hosted by Anthony Anderson. Beyoncé, Viola Davis, Regina King, Dwayne Johnson and Chance the Rapper will battle for the Image Awards esteemed Entertainer of the Year accolade.